Jim Cluett, W1PID, was serious. But keep in mind he’s 71 and I’m a spry 65 years of age and there were at least 12 inches of snow on the ground. No, we weren’t reenacting a segment of some old Laurel and Hardy movie, but anyone watching us might have thought so. 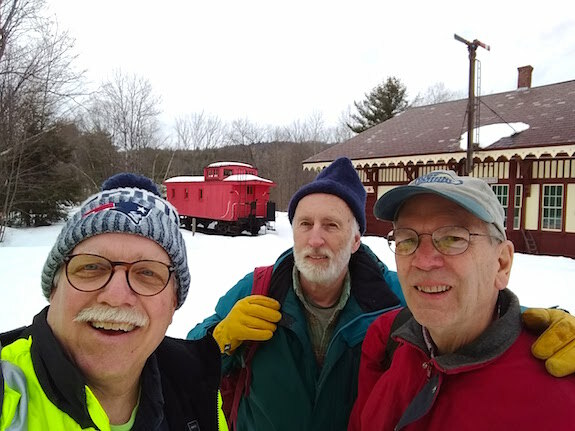 Jim, Dave Benson, K1SWL, and I had decided a few days earlier to take advantage of the balmy 43 F weather in central New Hampshire. The first thing to realize is temperatures like this might not be felt until the end of March so we didn’t hesitate to do our first outing of 2018. 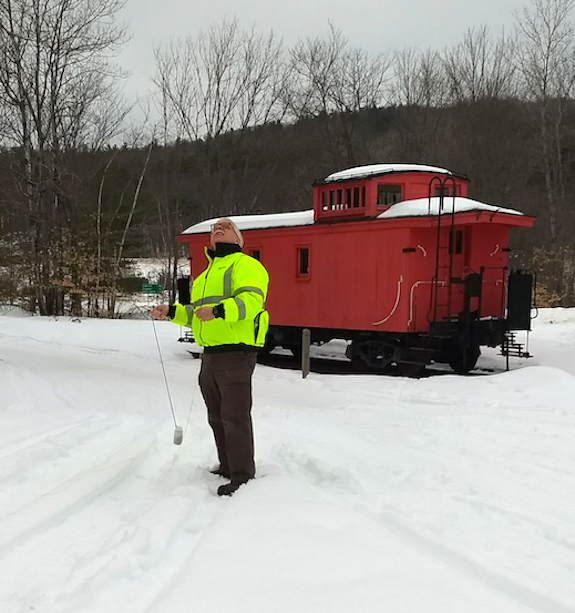 We agreed to operate at the restored Potter Place railroad station in Andover, NH. 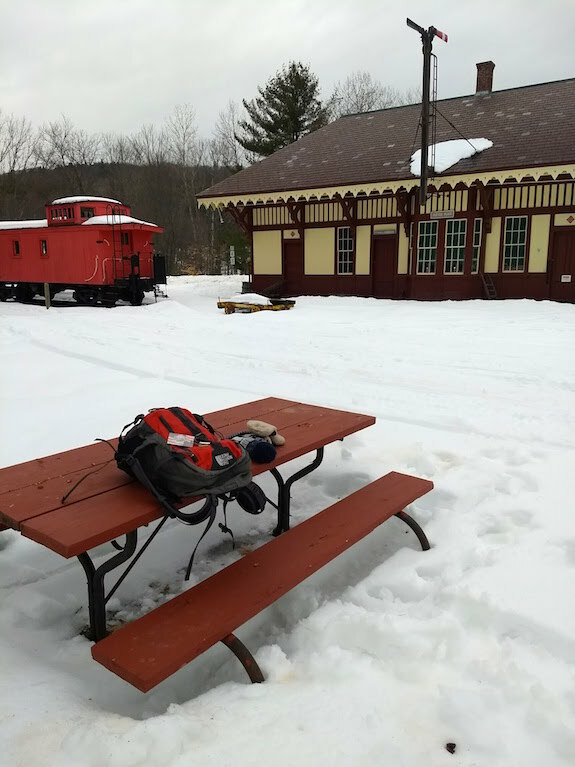 Not too many decades ago quite a few Boston and Maine steam trains would race by or stop at the station platform just a few yards from where we were set up on a picnic table. 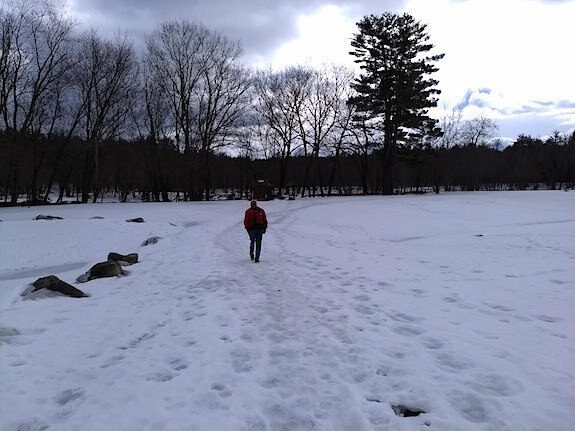 On this day, we just had one or two snowmobiles putter by on the railroad bed that’s now the Northern Rail Trail bike and hiking path stretching from Franklin NH to Lebanon, NH. Potter Place is a great halfway point for Jim and me to meet Dave as he lives west of Andover and Jim and I live east. Jim decided to set up on a box under the roof overhang of the station. Dave and I chose to use a picnic table Dave had cleared of ice and snow the day before as he happened to drive by Potter Place. It’s important to realize it was my job to deploy my 29-foot vertical wire antenna attached to a 9:1 unun and a 15-foot counterpoise wire. I got out my bright green halyard line, spread it out and tied it to my handy 8-ounce water bottle. Rotating it with my arm I made a perfect launch up into a bare oak tree. The bottle soared up about 45 feet and I expected it to fall to the ground as it always does. It didn’t. Somehow the line got snagged on some tree wart on a branch. Jim had taught me years ago to tug gently on the line to try to get the bottle to overcome the resistance. It didn’t work. I got frustrated and started pulling hard on the polyester cord, the bottle jammed in a notch about 35 feet up in the tree and the cord broke. Damn it! I hate losing water bottles. The same thing happened to me at my own house back in October as I was relocating my shack dipole antenna. That’s a story for another day. Dave got out his padlock and parachute cord and moments later the antenna was up, but I wasn’t a happy camper. 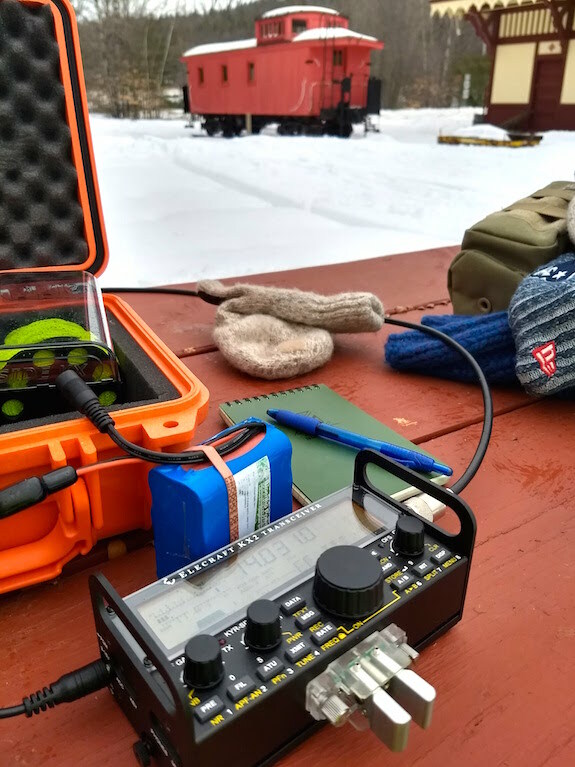 We decided to use my Elecraft KX2 and within a few minutes, we were on the air. Jim had already scored at least two QSOs as I struggled with the antenna setup. I couldn’t believe it and rotated my head to see the rock-filled bottle about 12 feet up in the air! Dave had a round-point shovel in his truck and the game was on. Jim came over from the train station and started to toss the shovel up at the bottle hoping to coax it down the rest of the way. His throws didn’t work and I tried to do the same with hapless results. “Listen, if I get up on your shoulders that will give me enough height to swat at the bottle,” mused Jim. Moments later Jim climbed up onto the picnic table and a moment later he was balanced on my shoulders. I only did this because if I dropped him, we’d both fall in the soft 12-inch snow cover. The bottle was dangling about ten feet away from the table and I made my way over there. Jim was bobbing back and forth on my back as his outstretched arm with the shovel in it tried to hook the bottle so he could pull it down. It didn’t work and I was rapidly running out of muscle power to continue to hold Jim up. I kneeled down and no one got hurt, including the water bottle. “Listen, let’s stand on the garbage can that’s over at the station. Surely that will give us enough height.” Jim always has good ideas. He went over, pulled out the plastic liner and brought the heavy can to the bottle retrieval area. All the while Dave was just immersed in watching us bumble about trying to snare a $3 water bottle. No doubt he was laughing, but being the polite soul he is, he kept his thoughts to himself. Jim clambered up onto the can first and had no luck. I got on and within a few moments was able to swat it with enough strength to bring it down out of the tree. After the celebration ended I finally got on the air and made three QSOs, two of them DX. Here are my three contacts. Dave and I shared the KX2 and had great success on 30 meters. 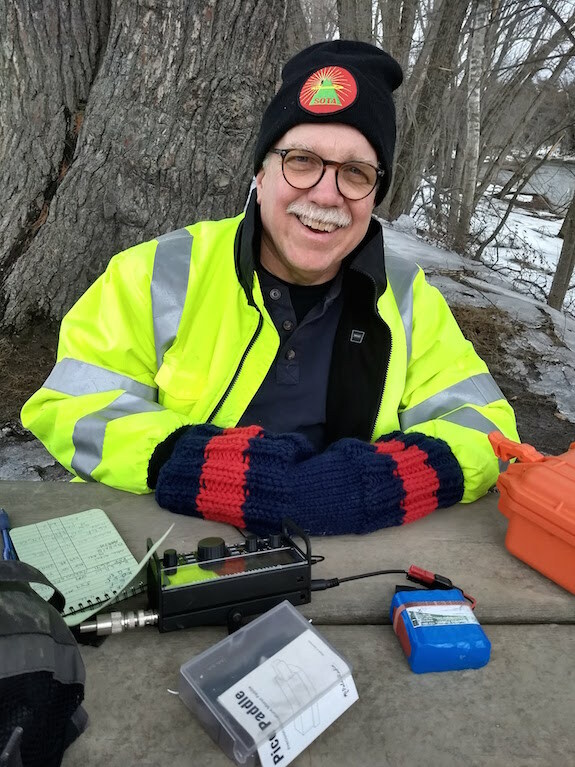 Just before packing up we were very lucky to hear Joe Everhart, N2CX, who was outdoors as well in New Jersey doing a Parks on the Air activation. All three of us each had a short Morse code conversation with Joe exchanging signal reports and pleasantries. We were all in a great mood and the outing was far better than any had guessed it might be. I feel we would have been happy having just two contacts each and not getting back in the car and truck frostbitten. 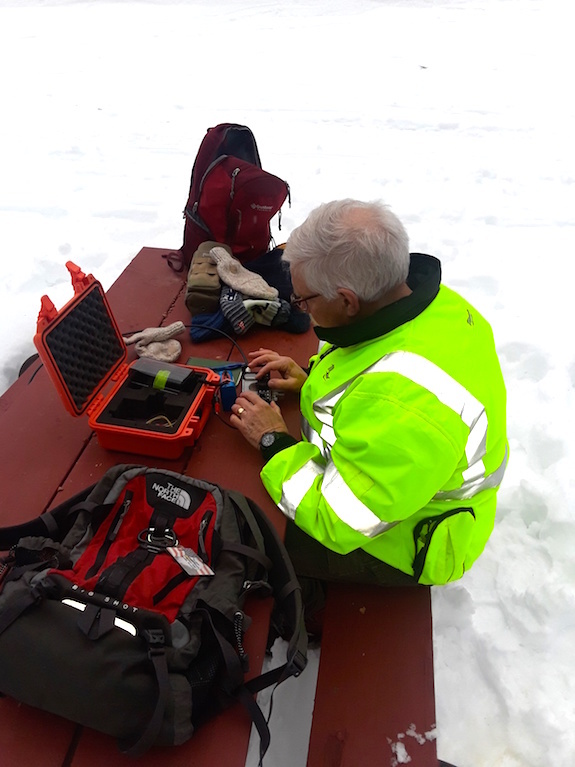 I never was cold at all and am blessed that I can still continue to learn more about outdoor radio and QRP from the two legends that allow me to tag along. Truer words have never been spoken. I’m glad my water bottle is safely in my backpack waiting for the next outing! Just as I was getting ready to move two water softener drain lines, I got a text message from my friend Jim Cluett, W1PID. 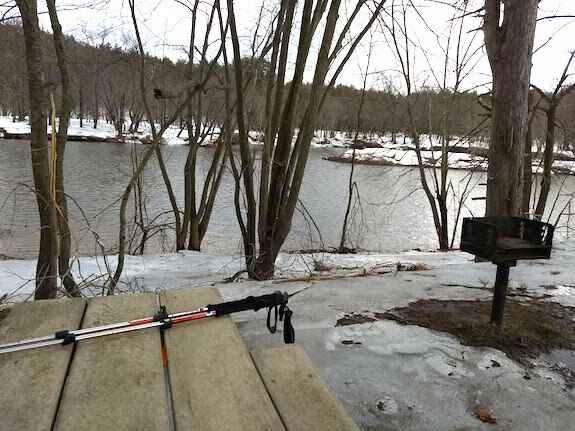 The plan was to set up along the shore of the Pemigewasset River just east of Profile Falls. Profile Falls is one of New Hampshire’s many dramatic waterfalls and is located about two miles south of Bristol, NH. 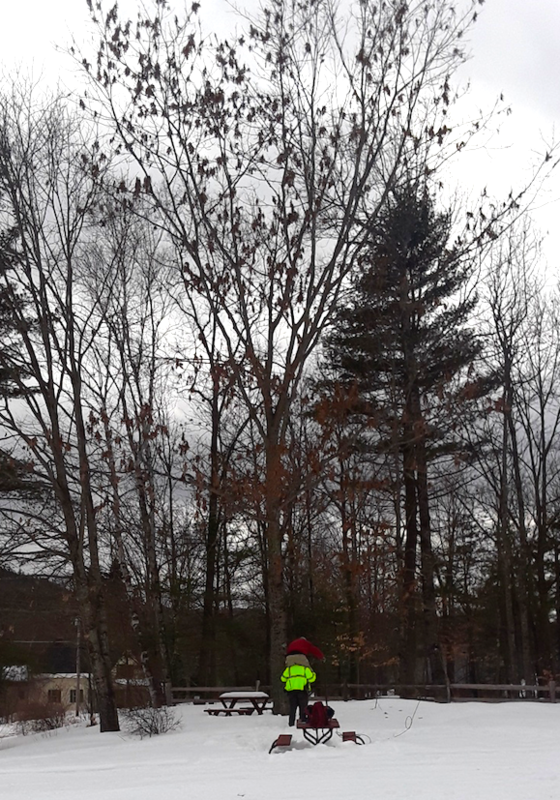 The weather was warm for this time of year in central New Hampshire. 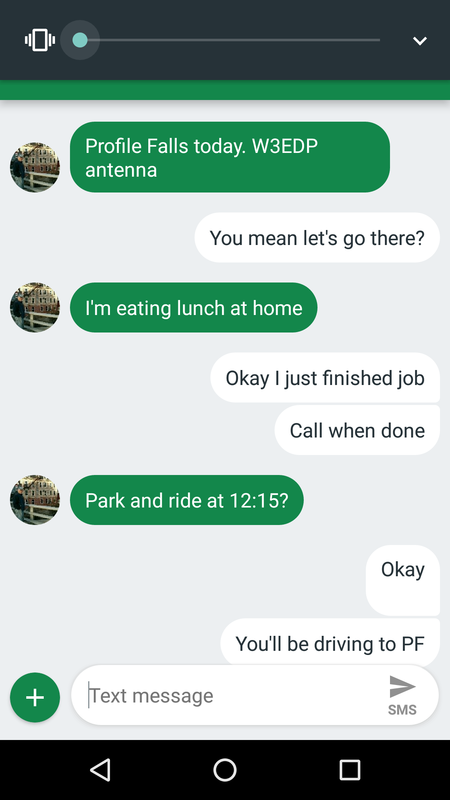 It was above 40 F by mid-morning when Jim texted me. 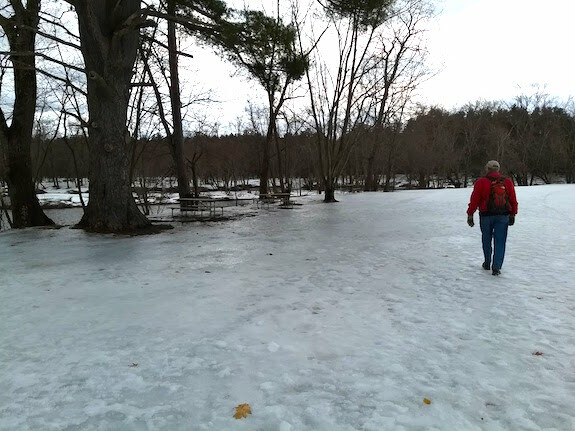 Late February in central New Hampshire can be icy. Daytime thawing freezes at night. Add to that we were going to a Corps of Engineers flood control basin where January flooding created massive sheets of ice we needed to navigate to get to the river. A towering majestic pine tree that’s at the top of the riverbank is about 1/3 of a mile from the parking lot. Jim and I were headed there to sit at picnic tables. 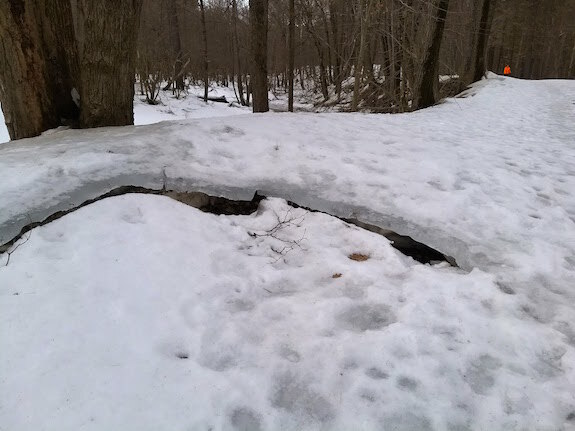 The trail is very level, but had a layer of soft snow covering the ice that was suspended 16 inches or more in places above the frozen soil. I didn’t waste any time getting my antenna into the huge pine tree. On my first throw, my water bottle soared over a branch about 40 feet in the air and dropped down perfectly straight just 7 feet from the corner of the picnic table. In minutes I was on the air while Jim was playing patty-cake with his complex antenna, a design developed by W3EDP. That’s the thought that popped into my head as I was turning on my radio all while Jim was mumbling and cursing as he walked back and forth and back and forth across the ice between two trees. Sure enough, my first QSO happened within three minutes of getting on the air. It was a DX (international) contact with Bruno, F5NTV in France. Thousands of operators in the Midwest and Western USA are jealous of us because we can get international (DX) contacts as easy as we work those west of us across the fruited plain of the USA. Jim’s worked Bruno many times before, but he wouldn’t today. Walking to the river the air was calm, we were both warm and it was delightful. But once I started to set up on the one table, I noticed the wind. It was gusting and biting. When the WX starts to get your attention, it’s never a good thing. At one point a gust blew my Rite-in-the-Rain log book and launched my pen into the mud. Within 30 minutes Jim and I were packing up to walk back to his car. My hands got cold because I had to take them out of my wool Morse muff to spin the VFO dial and write in my log book. Jim complained that everything on him was cold. Even though we were chilled, Jim and I agreed it was great to get out. The weather forecast for the next two weeks is promising. Let’s hope for some sunlight next time!